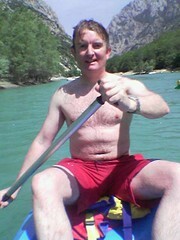 Today Eve & I started our day with a couple of hours’ canoeing in the Grand Canyon du Verdon. It was lovely to be able to just jump into the water to cool off. Then we drove to Fayence, where we’ve just checked in to the charming little hotel that Géraldine recommended to us. Time for a shower and a nap, them we’ll explore the town. Tomorrow, perhaps Grasse, then on back to Nice. And the day after, back home to Helsinki. We’re high on the south side of the canyon. From here the view down into the canyon is spectacular. 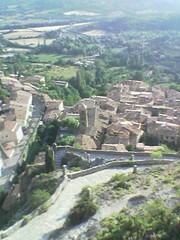 We can see Moustiers in the distance – the village which seemed so high now seems almost at the same level as the lake. Even here we are surrounded by butterflies fluttering and gliding about. Aiguines is a small village overlooking Lac de Ste Croix at the mouth of the canyon. 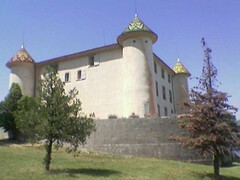 Its castle has these beautiful tiled rooves on its towers. Today we’re visiting France’s Grand Canyon – you can see its start from the lake behind Eve. There are canoes you can hire to paddle down the canyon – that looks like a lot of fun, so we’ll probably try that tomorrow. This is the view from the chapel of Notre Dame, up on the mountain above Moustiers. 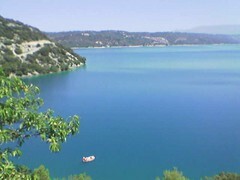 Our first view of the lake, and it’s spectacular – such a remarkably deep azure blue. 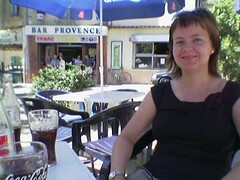 Eve & I are on our way from Aix-en-Provence to Moustiers-Ste-Marie (near Lac de Ste Croix). We’re taking the back roads, and have stopped for a morning break in a small country town called Varages. We’re sitting in the town square, where the local bar has set up some tables with parasols. The old men of the town are here, chatting away while they drink Cokes and coffees. Eve thinks that it’s much more healthy than the English Sunday lunchtime beer, and it’s true that the old men are slimmer. 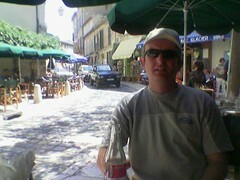 We’ve just had lunch in Lourmarin, on our way to Aix-en-Provence. It’s yet another pretty, ancient village – they’re starting to blur together a little. Today is maybe the hottest day yet. Today Eve & I are canoeing down the river to the Pont du Gard, which we visited earlier. The scenery is beautiful, and the weather is hot and sunny – we’ve just stopped for a quick swim. 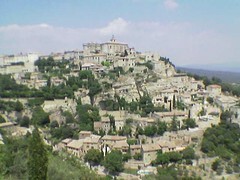 We’ve just had lunch in the beautiful hilltop town of Gordes. Being on top of the hill was a blessing, as the cool breezes gave relief from the heat – it’s 33 degrees and very sunny. Now we’re off to Sénanque abbey, just the other side of the hill.